which is commonly pronounced either “fee” or “fye” (but never “foe” or “fum”). corresponds to altitude. On the Earth, altitude is measured as the distance above or below sea level. In spherical coordinates, however, altitude indicates how far in space a point is from the origin. 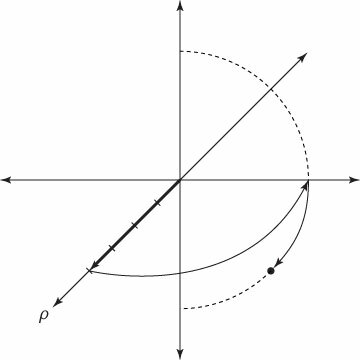 corresponds to longitude: a measurement of angular distance from the horizontal axis. corresponds to latitude. On the Earth, latitude is measured as angular distance from the equator. In spherical coordinates, however, latitude is measured as the angular distance from the North Pole. (rho) for r. Either way, the coordinate means the same thing: altitude, which is the distance of a point from the origin. In other textbooks, the order of the last two coordinates is changed around. Make sure you know which convention your book uses. Count 4 units outward in the positive direction from the origin on the horizontal axis. from the horizontal axis (again, as with polar coordinates). Imagine a single longitude line arcing from the north pole of a sphere through the point on the equator where you are right now and onward to the south pole. from the north pole — that is, halfway between the equator and the south pole — and plot your point there.